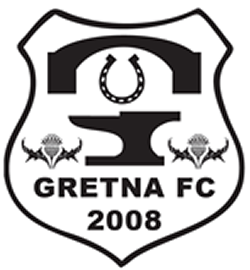 There was Cup misery for Gretna FC 2008 as East Kilbride lifted silverware for the second year in succession, adding the Lowland League Cup to last season’s South Challenge Cup. Kick off at Gala’s Netherdale Stadium was delayed for 10 minutes as coaches from East Kilbride were delayed by an accident on the motorway but the sun blessed the start of play after earlier drizzle. Kilbie took the game to Gretna in the early exchanges and Brady and Victoria were to tease and torment the Gretna defence all afternoon. With 12 minutes gone East Kilbride were awarded a penalty following a hand ball by Alan Inglis. Joao Victoria made no mistake with the conversion to send East Kilbride into an early lead. Gretna fought their way back into the match but Kilbie were fast and dangerous on the break. Brady brought out a great save from Murray in the 2008 goal but Gordon in the opposite goal was not to be upstaged and was in similar form to deny Adam Main. Play was sweeping from end to end. Anderson won a corner which Kilbie easily cleared. The ball was sent up the park. Brady passed to Victoria who spurned an excellent chance to make it 2-0. Minutes later McBride headed into the arms of Murray. In the dying minutes of the first half, Gretna got the equaliser they deserved. Gordon could only parry a Milligan header which came to Anderson who headed home the rebound to make it 1-1. Gretna ended the first half the stronger and as the interval approached Anderson nearly linked up with Longcake to give Gretna the advantage. But the terrific first half advertisement for the Lowland League ended all square. East Kilbride shocked the hoops with a 90 second solo effort by Craig Howie who carried the ball up the park and shot into Murray’s right hand corner to make it 2-1 to the Lanarkshire side. Gretna were stung and Anderson tried to respond immediately but could only shoot into the arms of Murray. Morris blocked a shot from Longcake. Then Anderson linked up with Main but EK were back in numbers to deny them. As Gretna chased the game, Dan Wood was brought on for Dan Graham on the hour mark. Shortly afterwards, Hastings replaced Victoria for EK. Kilby were still dangerous on the breakaway. They should have increased their advantage when Brady cut a ball back for McLeish who blasted it over the bar. Nick Cassidy came on for Darren Addison in the 65th minute. EK also rang the changes with Michael Giblin replacing Michael Morris and Martin McLoughin on for Bernard Coll. Five minutes later in Stuart Rome’s final spin of the dice, Michael McAnespie was brought on for Alan Inglis. As East Kilbride started to dictate the pace of the game, Gretna were continually exasperated in their long range efforts, first from Longcake then from Milligan but with Gretna trying for the equaliser it was Brady who put the final beyond doubt when in the dying minutes he scored Kilbie’s third. 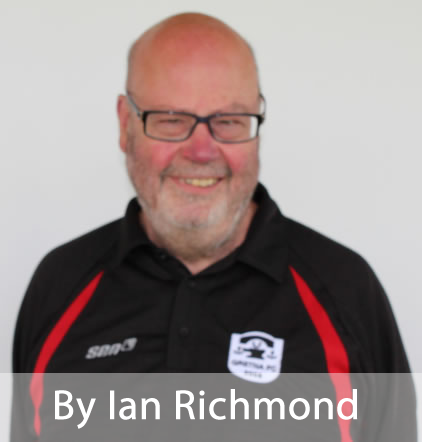 An engrossing game which East Kilbride on balance deserved to win.